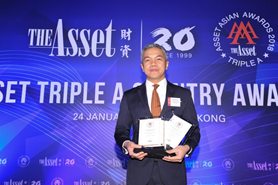 For the third year in a row, China Bank Capital won as the Best Bond Adviser in the Philippines at The Asset Triple A Country Awards 2018 held recently at the Four Seasons Hotel in Hong Kong. China Bank was also recognized for its role in two award winning transactions—the Bloomberry Resorts and Hotels P73.5 billion syndicated term loan, one of the largest corporate syndications ever arranged in the Philippine debt market, awarded as the Best Syndicated Loan in the country; and the Ayala Land P10 billion retail bonds issue, the first-ever corporate bond with a repricing structure during the life of the bond, cited as the Most Innovative Deal. Having retained its leadership in retail bond issues, the latest awards affirm China Bank Capital’s strength in financial advisory deals and debt and equity transactions. China Bank Capital, the investment banking arm of China Bank, was registered and licensed as an investment house in November 2015. In just three years, it has made its mark in the capital markets, becoming one of the top choices of issuers. Last year, aside from The Asset, China Bank Capital was awarded by FinanceAsia as the Best Debt Capital Markets House in the Philippines, by Global Banking and Finance Review as the Best Bank for Debt Capital Markets, by the Philippine Dealing System as the Top Corporate Issue Manager/Arranger, and by the Investment House Association of the Philippines as the Best Fixed Income House. Now on its 20th year, The Asset’s annual Triple A recognition represents the industry’s most prestigious awards for best-in-class institutions operating within the region.